The Hirama is part of Armr Moto’s small range of textile jackets, going for just £120, or £20 more than the Armr Kiso jacket I bought myself a couple of weeks ago. Liking what I wrote about the Kiso (since lost in cyberspace), Armr Moto sent me the higher-spec’d Hirama to evaluate. 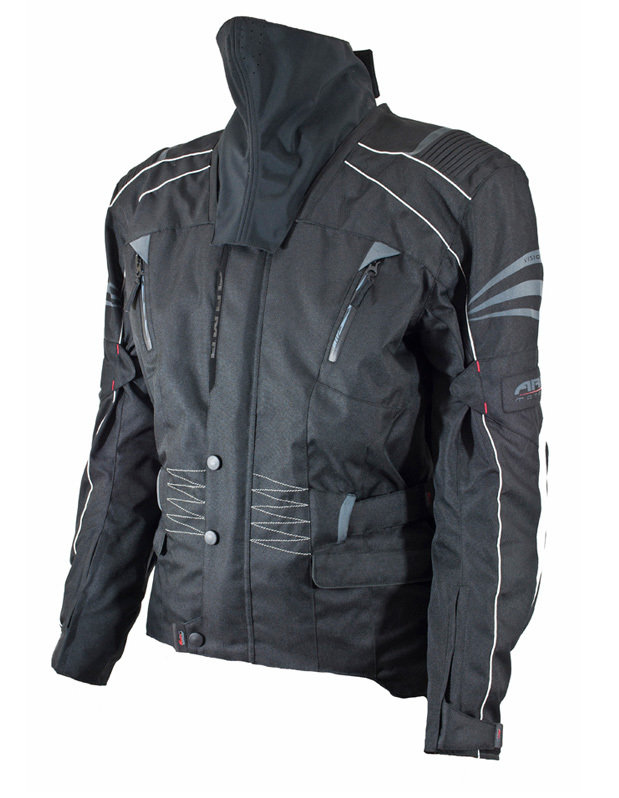 Well featured, smart-looking and great value riding jacket with detachable liners, but a bit short on useful pockets. The Hirama is pitched as a winter jacket and with all its liners weighs 2.45 kilos, about half a kilo more than my Kiso. The waterproof and thermal liners (the later zipped to the former) account for 600g, so unlined the Hirama weighs about 1.85kg. 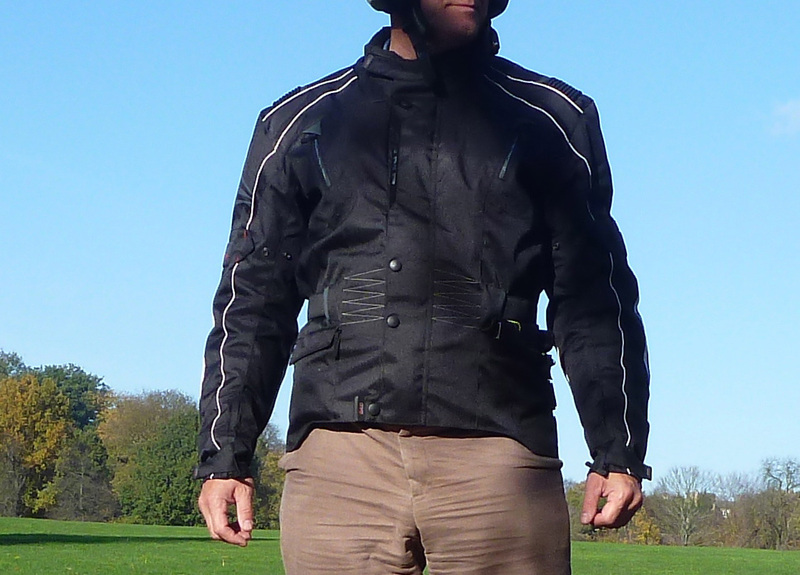 I nipped down to the shops, and off the bike the jacket felt a bit bulky for town riding, though I guess that’s winter biking for you. Worn without all the lining clobber, sitting over the keyboard the 2XL 600D Hirama felt better – comfy but with room for padding (I’d use my own electric liner when needed). You get an adjustable waist belt which feels in the right position (unlike my Kiso), but airy shoulders which are bulked up with the inner protection and exterior padding. The back hem is cut an inch or two lower than the front, with twin side-hem velcro adjusters similar to my old Darien, as well as the pull back velcro waist belt mentioned. 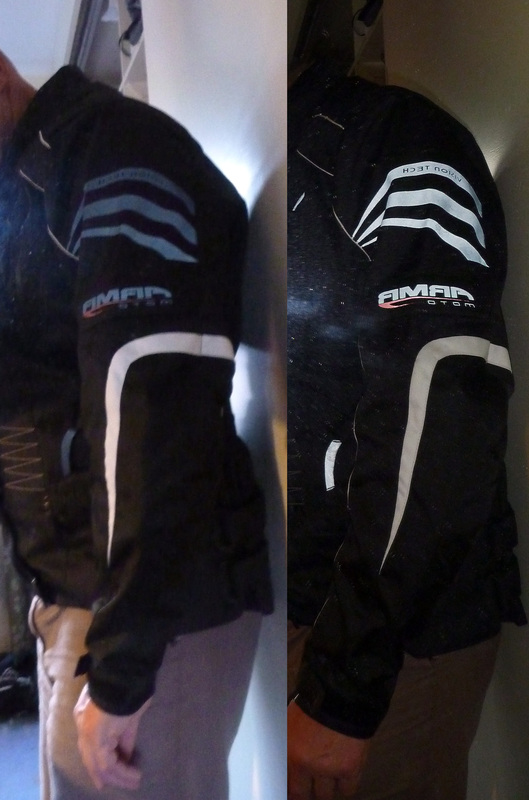 Inside the jacket back you get an elasticated half zip panel to match up to Armr Moto’s range of pants (see below). Other adjustments include zip bellows + velcro tabs at the wrists (above) and a three-position cinching stud on the biceps (left – not as flexible an arrangement as on the Kiso). Like the Kiso, the arms cannot be described as short. All the detail and build quality looks as good as the Kiso and includes discrete grey reflective slashes applied to the arms (right), as well as the more obvious white slashes which together all shine brightly when lit. 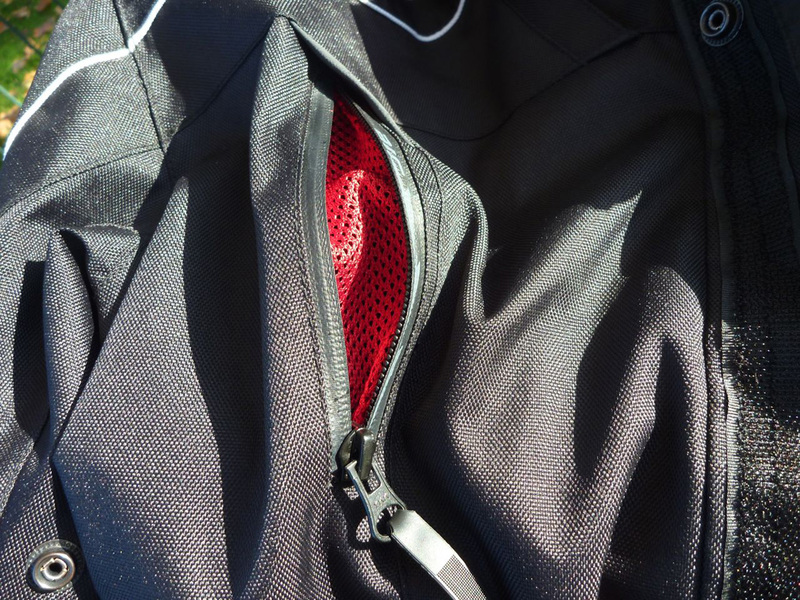 The biggest drawback for me are the minimal size and range of pockets: just two barely hand-sized velcro + zip pods on the front as well as a larger, hand-and-a-half sized pocket inside the storm flap but (cleverly) outside the main one-way zip. Attached to the mesh lining inside is a mobile phone pocket with a duplicate in the thermal lining, so that’s four or five in total – not half as useful as the Kiso. But like the Kiso they do come with a waterproof-like lining, plus those silica anti-humidity sachets which suggests the pockets are vapour-proof. The collar is a low, paddled number which comes with a zip-on neck-tube/ mask (right) which initially looked a faff. I suppose it’s nice having a low collar for easier over-the-sholder life-savers when stretched out across your ZXR12 on the M9, and now I think about it, the detachable tube is actually quite clever in that it goes up under the helmet and then zips over the low collar’s top edge and the vulnerable front top closure, overlapping like a roof tile, so greatly reducing the chances of down-neck drippage. 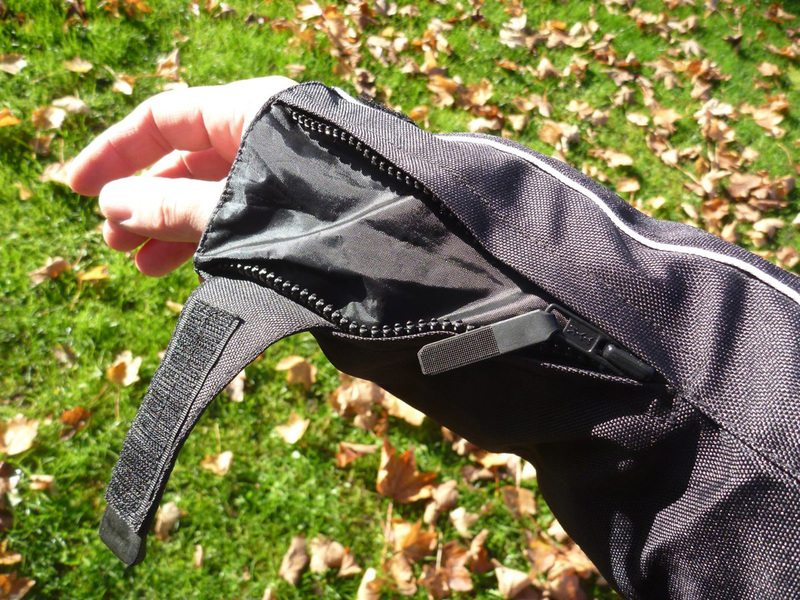 I believe I’ve seen this feature on other jackets and while it looks a bit clumsy to zip up both sides, it’s actually a practical feature that’ll help keep you dry and warm. As with the Kiso, you also get a pocket in the back inner mesh to take a spine protector or it occurred to me, a hydrator bladder if you like your drinks warm. Vents come as a vertical zip pair on the chest and counterparts on the back shoulders. As I say in the Kiso review, lets hope the vents’ cooling potential doesn’t come at the cost of pelting rain leakage. I’ll find out soon enough on my Kiso. The Hirama comes to you with two zip-in liners – the waterproof ‘Reissa’ membrane with taped seams (see below), and a super-thin thermal liner which zips onto that. It does mean that when fitted there’s an extra front zip to do up, but it also gives the Hirama unlined summer/shower versatility or snug wet and cold options. To reduce wetting-out (the outer getting soaked and taking ages to dry) the Hirama is coated with a water repelling DWR treatment. 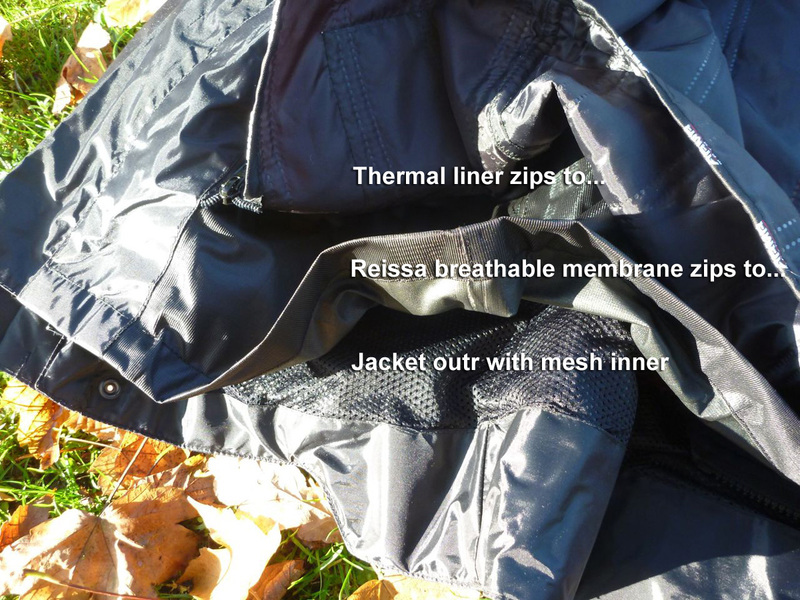 I’m of the opinion that the traditional-style membrane bonded to the jacket outer is the way to go (as with the Kiso) and that liners are an cost-saving solution, sold as a ‘have your light summer jacket [cake] and eat it’. 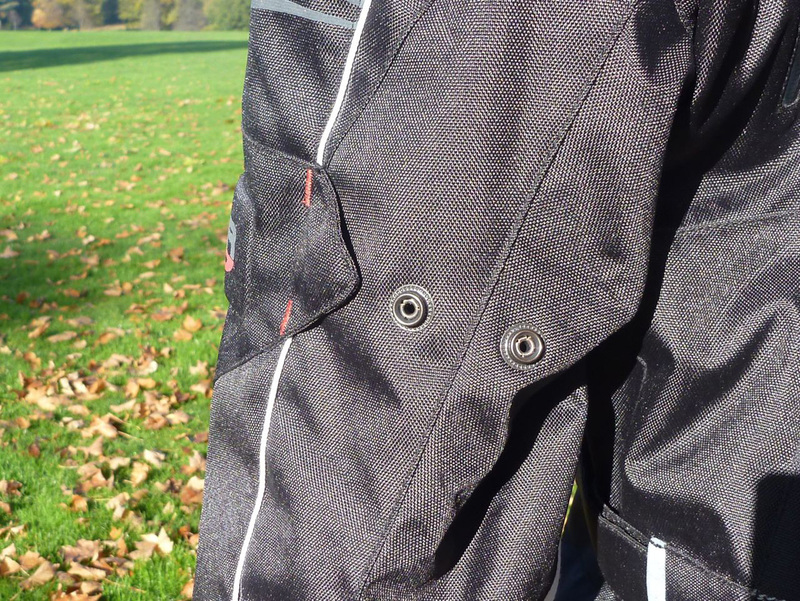 But I could be being a Luddite here; after all separate membrane liner can be replaced or even upgraded upon if it fails, while tears and crash damage to the jacket ought not impinge on impregnability. Perhaps a low-end liner which breathes less well (is more sweaty) than say, top of the range Gore-tex Pro Shell is not such a bad idea – being removable for warm weather comfort. The Hirama doesn’t claim to be an adventure-style jacket and to me is not as pocket-practical as my Kiso which itself is less good than my Aerostich Darien with it’s array of huge pockets. But I don’t recall my first Darien being waterproof on its first day of rain, and every breathable jacket will leak sooner or later once the fragile membrane fails. That’s why something like a Rukka over suit is the way to go if you positively have to keep dry. With the lower waist belt the Hirama sits notably more comfortably on me; the tiny pair of outer pockets are the price you pay on a short jacket. Neck to hem along the main front zip, my XL Kiso is 27″ while this 2XL Hirama in a shorter, bloussony style is 24.5″ (though as said, the back hem drops down). As for looks and style, it’s all subjective of course but the Hirama is not too tacky at all. There are worse looking jackets costing much more and like it or not, appearance is a primary driver in how we buy stuff like clothes: will my bum look cool in this? I also have a pair of Hirama pants to try out, higher spec than the Haro pants which I’ve given to a mate who rides to work every day. He’s since reported that on their first deluge they kept him dry and warm. Good to know. 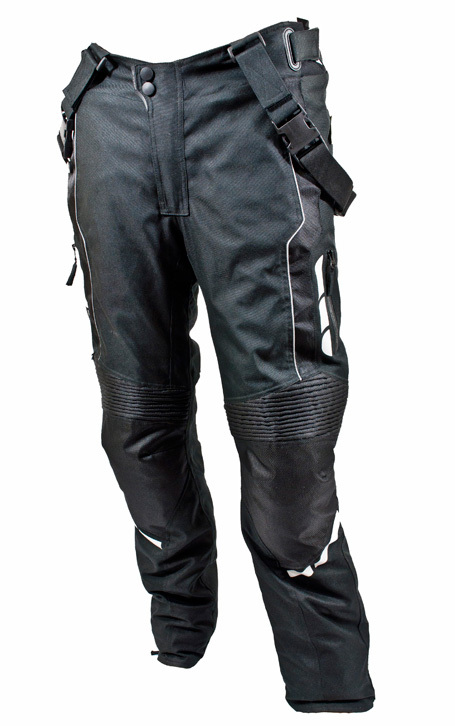 Like the Hirama jacket, the Hirama pants come with the same zip-out wet and warm liners. More news about them when the right size gets sent back. 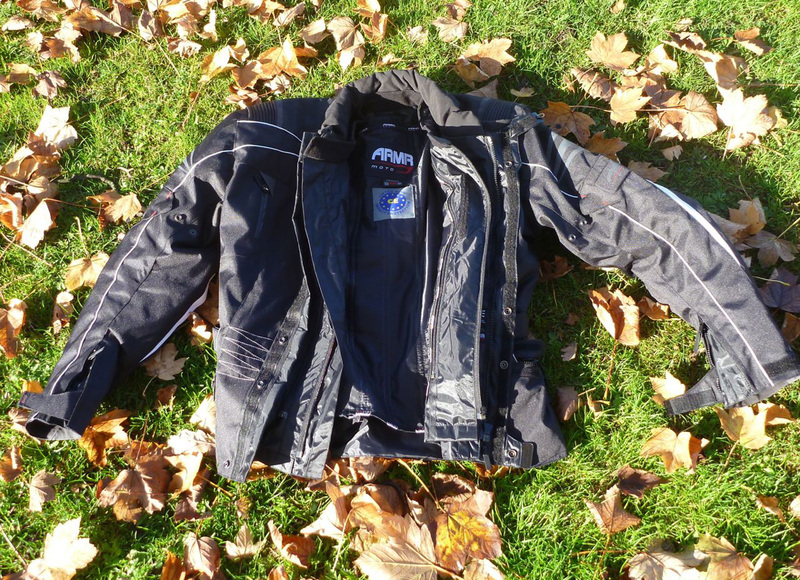 This entry was posted in Adventure Motorcycling Gear Reviews, AMH News, Jackets & Trousers and tagged Armr Kiso jacket, Armr Moto Hirama jacket, Armr Moto Hirama jacket review. Bookmark the permalink.